Jill Bruno, DO, is a diagnostic radiologist specializing in breast and abdominal imaging. 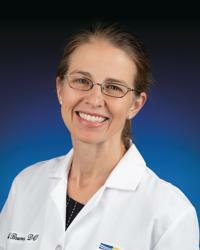 She is board certified in diagnostic radiology and is fellowship trained in abdominal imaging. Dr. Bruno interprets screening and diagnostic mammograms, including Tomosynthesis (3D) mammograms, and she performs stereotactic and ultrasound guided breast biopsies. She sees patients at MedStar Union Memorial Hospital, MedStar Good Samaritan Hospital, and MedStar Bel Air.